In order to decrease traffic and provide safer routes to school, please review the information below about getting to and from school. If you are looking for a group of Arroyo students for your child to walk or bike to school with, then please sign up for our Walk to School Bus database. This database is used to organize neighborhood groups to walk, bike, or even carpool to school and back. Please contact Lesley Ryan at lesley.lam@gmail.com to sign up or get more information. 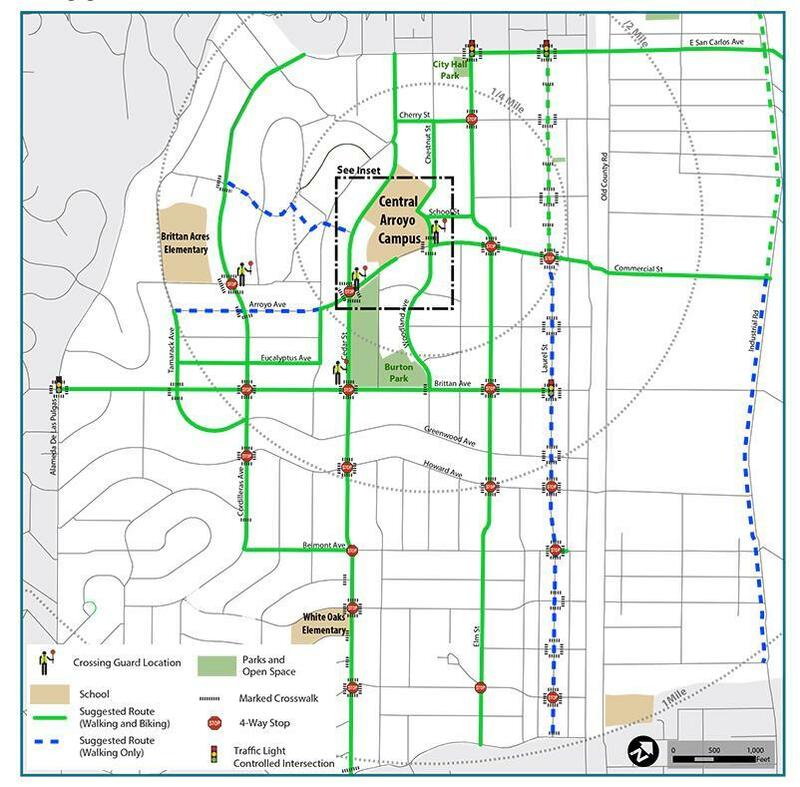 This Walk & Roll to School map provides you with information to improve your choices as you walk, bike, scooter, skate, carpool,or bus to school. We cannot guarantee the safety of these suggested routes; parents are encouraged to inspect the routes on their own to ensure that the routes are as safe as possible. NOTE: Do Not Cross Arroyo Ave mid-block between Cedar St and Woodland Ave. While this may seem like a great shortcut to get to class or the San Carlos Youth Center, it has been identified as a safety hazard. Oncoming traffic cannot see or stop in time when students dart out behind parked cars and run across the street. Instead please cross the street at either Woodland Ave or Cedar St where there are staffed crossing guards there to increase visibility and safety. All bike and scooter parking is located by the Wild Zone. There is no bike and scooter parking on Arroyo Ave. This will remain locked until after school. We will not open the double gates to exit students on the Arroyo Ave side of the school. However, we will continue to open them in the morning for students to enter the school. 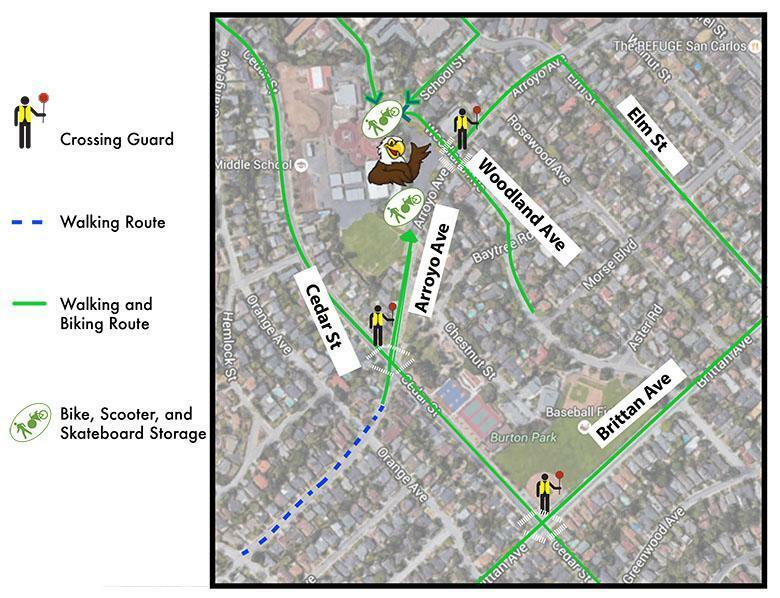 All walking/ rolling students will exit the school on the Chestnut/ Woodland side of the school so that they must cross Arroyo at Woodland Ave. if they are traveling to the Youth Center, Burton Park, etc. Please note: Students will not be allowed to walk in front of the Arroyo parking lot entrance or exit (which is currently being enforced). Remember that bikers must follow traffic laws, including wearing a helmet, stoping at STOP signs, and signaling other drivers before making a turn. Please review safety procedures with your children as the volume of cars on the road before and after school is significant. There will be storage racks for commuting equipment on campus. Make eye contact with the driver before crossing in front of them. Avoid using devices, such as phones, when using the crosswalk. Stand away from a crosswalk entrance if you do not intend to cross, so that drivers will understand your intentions. Drop off and pick up your child at Burton Park. You can drop off and pick up your child at any point on the perimeter of the park. There will be paid crossing guards at the intersections above to ensure that all children who walk to and from school, and all children who are dropped off at the park, can get to and from school safely. 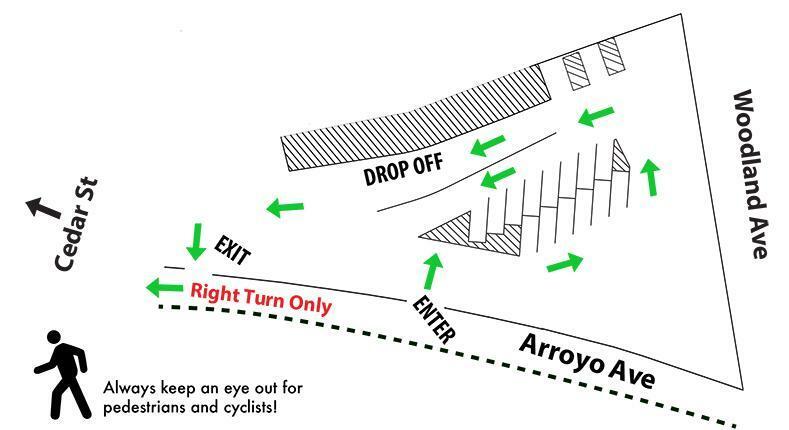 Enter into the Drop Off/Pick Up zone in the Arroyo parking lot on Arroyo Ave. Safety Patrol students will help facilitate morning drop-off. Please DO NOT park on Arroyo Ave. right in front of the parking lot. Your child will not be able to meet you there. Park in the parking lot or meet your child in the pick up lane. Drive slowly into the yellow hatched Drop Off/Pick Up zone. Pull all the way forward. During morning drop-off, please wait for safety patrol to open the vehicle door. Do not leave your car on while you are waiting in line. Always use the Drop Off/Pick Up zone for drop off and pick up. Please have your child exit/enter the car from the school side only. Please watch for pedestrians walking from their cars to enter the school. You may only turn right when exiting the parking lot. 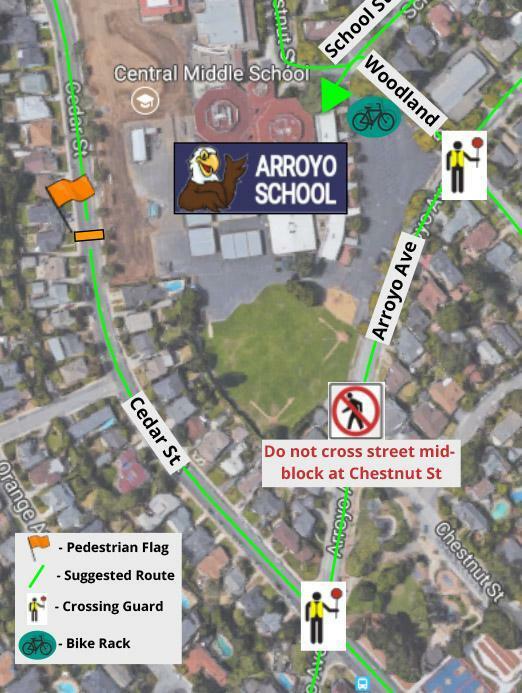 If students do NOT need to cross Arroyo Ave but need to exit on the school side of the street, they will be allowed to exit on the Arroyo side of the school (most students will not do this). But, they will not be allowed to walk in front of the parking lot entrance/ exit nor will they be allowed to cross the street, mid-block.